One thing I often miss about living on the east coast is the abundance of flea markets...every weekend you had multiple flea markets in PA or NJ to choose from and they all were filled with gems and deals to be had. When I was a little girl, my mom would always take us with her to the flea markets on the weekend and it was something I always looked forward to. It was my mother that really taught me the art of the flea market deal & the thrill of the chase. 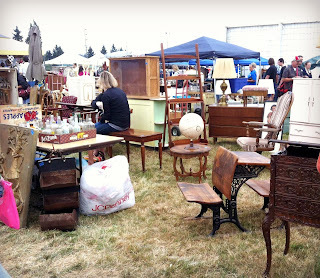 Now that I live in Oregon, we sadly don't really have those amazing weekly flea markets. We do, however, have one that happens two weekends a year and I look forward to it every time! This weekend was one of those rare & coveted weekends and I had an amazing time with my favorite yard sale co-pilot! Between the two of us, we scored a hodgepodge of really cool items and we had a really fun day of exploring the piles of treasures. I came home with a strange mix that included vintage posters, art supplies, a seal vertebrae bone, an old metal test tube rack, & a collection of Star Trek ornaments. Wear comfortable shoes. It's a lot of walking around, so get ready for it and dress for the part. The more comfortable you are, the more focused you can be. Choose your companions thoughtfully. This may sound a little odd, but if you are going to shop with friends, it’s important to pick a flea market buddy that can match your stamina. You should try to decide in advance if you want to leisurely peruse for an hour or if you want to go all in and spend hours digging through every booth. If you go on your treasure hunt with someone who’s expectations are not at all like yours, you are both in store for a rough day. I am always up for hours of digging and I need to look at every single booth, so I’ve learned who in my life can hang with that and who will hate me at the end of it. I consider myself pretty lucky to have an amazing friend that I often refer to as my “yard sale soulmate” because we are perfectly matched on our yard sale aspirations & stamina. Bring an extra bag. I like to bring a messenger bag that can be thrown over my shoulder and loaded up so that the weight of my buys is easier to carry and I also bring another smaller bag that is easy to carry (a tote bag with long handles or one of those lightweight backpack totes are perfect) so that I can keep buying without being too weighted down with the purchases. 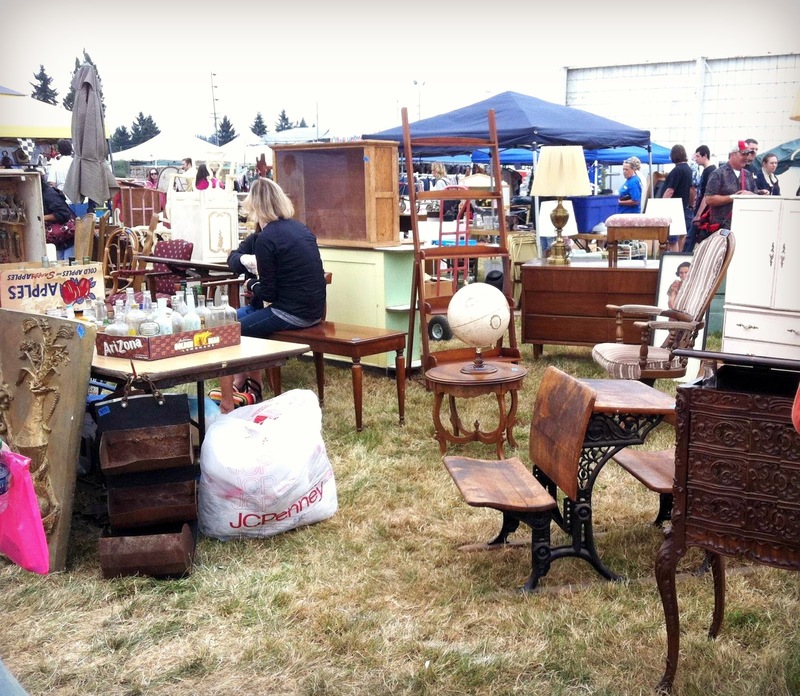 If the flea market is on even ground like asphalt or inside, you might even consider a rolling suitcase or cart to avoid carrying anything. I have one like this for just such an occasion. Bring small bills and change. Cash is king at the flea market and the ATMs there will have huge fees, so come prepared. Making exact change is always helpful for the sellers. Plus, if you are going to haggle a price from $3 to $1, don't be the jerk who then ask for change for a fifty. Get ready to haggle. A lot of vendors price items a little higher to leave room to haggle and if you have a price in mind that you want to pay, it doesn't hurt to ask. Bundling items is also a great idea - if the seller has multiple things you are interested in, ask what they could do on the price if you bought all of them or make an offer. It helps the seller move more items and you get a great deal. Be nice. No really, be nice to the vendors & make a connection. If you walk up to their booth with a big smile and say hello to them, more often than not, they will be much more opened to making you a good deal. It's human nature to be a bit more generous with people we like. Timing is everything. There are pros and cons to the time of day you go to the flea market. If you are the first wave of people there, you get the first pick of the goods and may find more gems, but the sellers will likely be a bit more firm on higher prices. As the day goes on, later shoppers may find that things are a bit more picked over, but sellers are much more interested in moving items that saying firm on prices, so you are likely to get a great deal. Watch out of knock offs. Don't get me wrong, I won't judge you for getting that really cute purse that says "Coach" on the tag for $20 if you just like the way it looks, but don't think for a minute that it is really Coach. There are fakes of almost everything from MAC makeup to vintage reproductions at the flea market. Just be aware of it and check the quality of the items carefully before you buy. Think outside the box. If you find something that catches your eye, but you hate the color, you can always repaint it. If the glass for that beautiful frame is missing, maybe it would make a great art piece or boarder for a bulletin board. Be open minded because you never know what you will find at the flea market. Most importantly, have fun! Enjoy being outside and learn new things about history through the items you find. 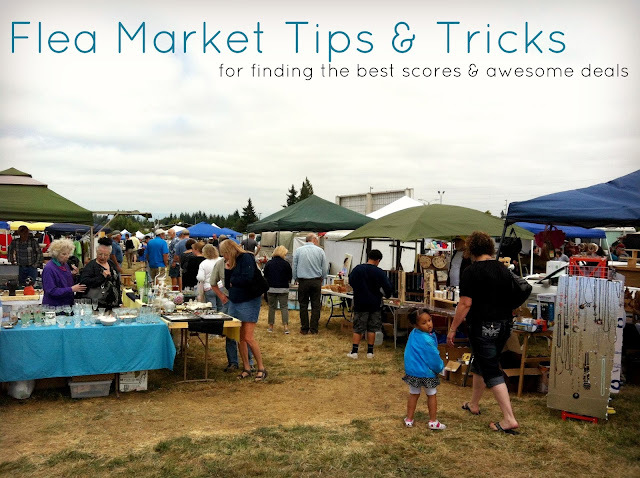 Sometimes you hit score after score and sometimes you come home empty handed, but if you set yourself up to have an adventure instead of creating a rigid agenda of must haves, you are sure to have the perfect flea market day! What are your favorite flea market tips? Have you found anything amazing lately? 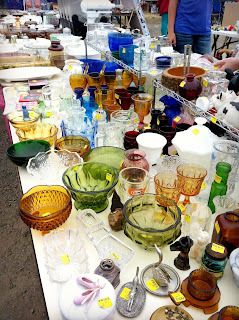 I have never been to a big flea market! I swoon over them on HGTV all that time. Do you know how I could find any local to me? Maybe just Google? Great tips and you hit the nail right on the head with all of these tips! !